Logo in the top of the application ? How to have a logo at the top of each page of the application with XForms (see attached example with Xamarin Logo) ? It's important to identify the application and this is a scouring request our customers to display their brand.. I tried to add Image, ImageCell, StaskLayout etc.. in a TabbedPage => Forbidden. I tried to add TabbedPage in a ContentPage => Forbidden. How can we do with Xforms ? Thank you @StephaneDelcroix‌, I have seen this solution but it's not good for Windows Phone, I think. 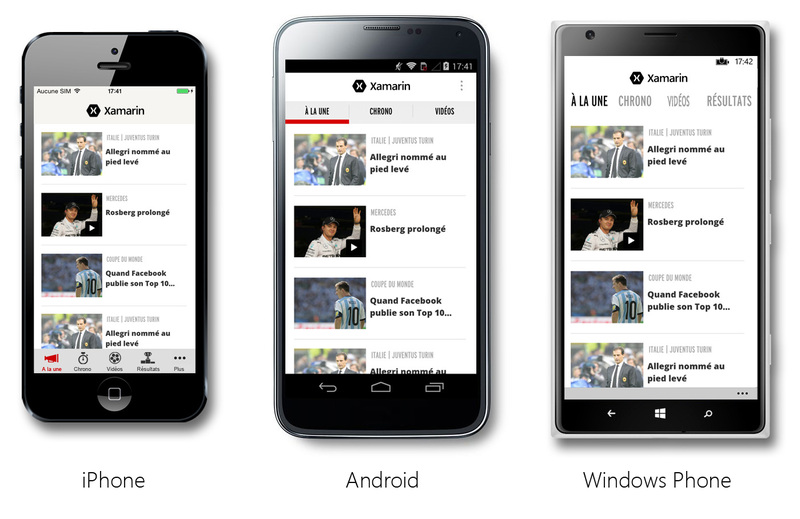 I'm developing a "News" application for a client and all applications I know with "News" show a logo in the top, including on Windows Phone (ex : Le Monde.fr, Le nouvel Observateur, L'équipe.fr, CNN ...) I have attached some screenshots. So I have to find a way to do the same thing otherwise my client will not be competitive. If I can not do 100% with XForms, can I add native code (in Android, ios and WP projects) to inject the logo above ? Have you a example to help me ? @adamkemp‌ I reminded them that there has Splashscreen and I offered them to make a very graphic first page with their logo and direct access buttons (to fill some) but they know that the largest 'News' applications of the markets (their competitors) display their logo in the top so ... It's in their specification.